Lock in a great price for B&B Het Vogelhuis – rated 9.6 by recent guests! I spent three days in B&B Het Vogelhius. The studio was impeccably clean and comfortable, the breakfast was very tasty and healthy, the neighborhood calm and charming. Jan is an adorable, cordial and very helpful host. I strongly recommend B&B Het Vogelhius. Beds were comfortable. Jan and William were very frequently and accommodating. The property was quiet and we really enjoyed ourselves. Would stay here again. The staff was warm and helpful. The room was so classy. The breakfast was really special. You won't get something this good with that price elsewhere. Jan and Wim were attentive and friendly. Breakfast was delivered when we wanted it, not fancy but fresh, filling, and focused on local foods. The beds were very comfortable and the place was very clean. We enjoyed walking through the park and along university buildings to the Centraal Station, the perfect starting point for our daily wanderings along the canals to historical buildings, restaurants, windmills, and gardens. We would definitely stay here again. Everything at the B&B is nice: the bedroom and bathroom are clean. A well equipped kitchen (shared) with a fridge and microwave oven. The breakfast is just fabulous. And the host is very nice. I really enjoyed my stay! Highly recommend! Everything! Starting from the breaksfast, the fact that we actually had a kitchen and the room was big enough to move around. The bathroom has everything you need and the shower is huge! The host, Jan, was very nice and open to help us and quite flexible to bring whatever we needed. I highly recommend B&B Vogelhuis! Short version: I liked everything. Long version: The room was comfortable, everything spotless clean, good breakfast. The host was helpful and willing to accommodate for whatever I needed. Quiet location close to the central station and the IT/maths part of the university. Breakfast served in bed (discreetly left outside bedroom door) was delicious. Our "birdhouse" apartment had everything - a skylight above our comfortable bed, a large modern bathroom just outside our door - all on our private top floor. Trees and woods viewed from bedroom window. Quiet residential neighborhood located within 5 minute walking distance from central train station. I really enjoyed my stay. The room was on the second floor, very clean, nicely decorated, spacious. Breakfast served the to the room and had everything, egg, yogurt, cheese, fresh fruit juice, etc. The distance from the central train station is only 10-15 minutes by walking. There are beautiful houses on both sides of the road and a park. 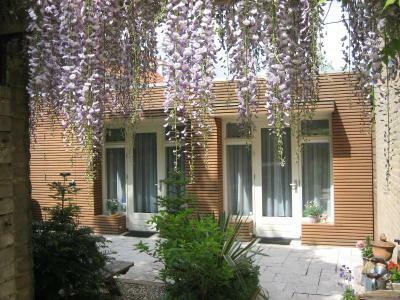 This bed and breakfast is located just a 13-minute walk from Leiden Central Station. Het Vogelhuis offers free Wi-Fi and private bathrooms. Leiden University is 6 minutes by foot. Each room is decorated in a light décor and features a flat-screen TV. They have a refrigerator as well as tea-and-coffee-making facilities. The bathroom is fitted with a shower. Breakfast consists of rolls, orange juice, spreads and eggs. It is served each morning in your room. There is a variety of cafes and restaurants within 0.9 mi from Het Vogelhuis. The historic Leiden center is a 15-minutes’ walk from the bed and breakfast. It is 1.4 mi to Rijksmuseum van Oudheden. Naturalis Museum is 12 minute by foot. It is a 6-minute drive to the A44 highway. When would you like to stay at B&B Het Vogelhuis? This room with view on a park features a flat-screen TV, tea-and-coffee-making facilities and a dining table. The bathroom is fitted with a shower. Please note that this room is located on the 2nd floor and only accessible by stairs. This room features a flat-screen TV, dining area and tea-and-coffee making facilities. You can make use of the shared kitchen. 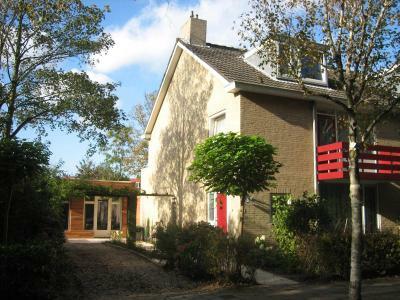 B & B ' Het Vogelhuis ' ( The Bird House ) is a small property with three rooms and can accommodate 8 people. It is only 13 minutes walk from Leiden Central Station and 15 minutes from the historic center of Leiden. One room is located on the second floor of the house (there is no lift) and two rooms on the ground floor with private entrances. They share a fully equipped kitchen and a cozy garden. All rooms have a private bathroom. The varied breakfast is served in the room. Hospitalety and privacy go hand in hand! House Rules B&B Het Vogelhuis takes special requests – add in the next step! Please note that parking in the street will be paid from November 1st onwards. The property has 1 free parking place on-site. Please inform B&B Het Vogelhuis of your expected arrival time in advance. You can use the Special Requests box when booking, or contact the property directly using the contact details in your confirmation. The spiral stairs to the third floor were not a problem for us, but visitors should know ahead that it is a possibility. Some would not have been able to make it. It will take a 10-15 minutes walk to the Leiden Central Station. To me that is fine. I had some difficulties with confirming my credit card after the payment couldn't be processed. I reentered my credit card details but it didn't work and my booking was cancelled after a few hours. I was lucky the room wasn't booked by someone else in the meanwhile, and I could take it back. Book early so not to miss. We really enjoyed our stay here. warm welcome by the host JAN, nice and quiet 'green' environment, modern well equiped room and kitchen, fantastic breakfast, the "birds" atmosphere. Lovely and peaceful. Park right across the street. Excellent breakfast. Very nice owners. Friendly owners. Good breakfast Great stay. The TV signal was tempremental and the location was about a 20 minute walk from the town centre - a little bit out of the way if you are walking back alone at night. Breakfast was lovely and delivered to my door at any time I wanted. Host was friendly and the room was clean and pleasent. The hosts are amazingly friendly. I had the warmest welcome, ever. I felt I was at home, for the first time during my trip, it was something special. The place is amazing, near is the park. In front of the door, there is the beautiful garden (The host is a wonderful gardener). The room is wonderful, more than you can expect. The breakfast is that you must have (Also you will be hosted by the amazing chef)! you just need to relax and enjoy your stay. For sure if I come back, I will stay there again. So if you go to Leiden, highly recommended staying there. Prijazen gostitelj in miren okolis.